After growing up in a city with a population the size of the whole of New Zealand, you might think a move to rural Franklin would be a bit on the quiet side. But for local artist and former Franklin Arts Centre gallery manager Suzette van Dorsser it’s the place she’s put down her roots as ANGELA KEMP discovered. Suzette van Dorsser grew up in Johannesburg with her parents and younger twin brothers before the family immigrated to New Zealand when she was 16 marking a crossroad in her life. “I’d always been interested in all things art and when I started at New Plymouth Girls’ High School I was thrilled at the range of art subjects on offer,” she says. “It was a turning point for me because at my high school in South Africa I used to have an art class that was only for three hours a week. At New Plymouth there were so many art subjects to choose from – painting, sculpture, print making, photography, design – all full papers. 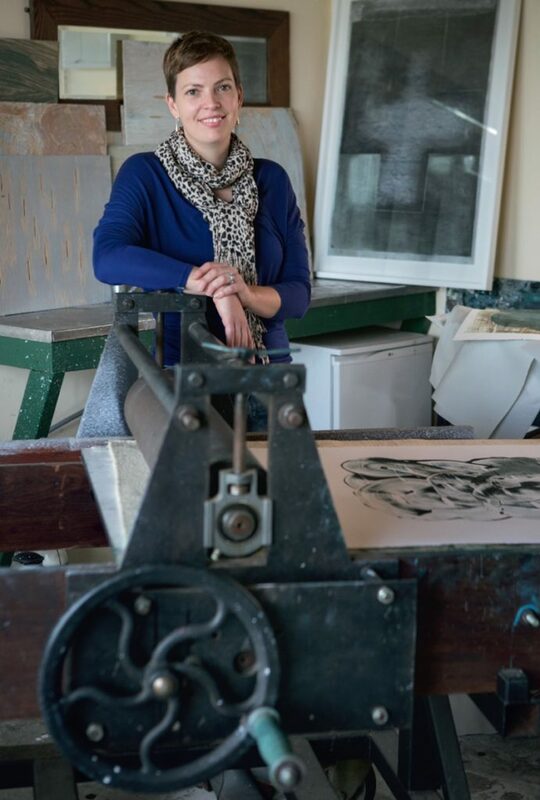 Suzette studied industrial design at Victoria University for a couple of years but realised it wasn’t for her and switched to Massey University where she was among the first intake at its newly-formed art school in Wellington. For the next few years she worked for several New Zealand fashion designers becoming involved in retail, fashion catalogues and fashion shoots for the likes of Robyn Mathieson and Anne Mardell. Through someone at work Suzette heard about a job at Franklin Arts Centre. Fortuitously, she was offered the position as gallery manager about the same time as she met Frans van Dorsser who had recently returned to run the family flower business, Shipherd Nurseries in Puni near Pukekohe. Love, as they say, blossomed, the couple married and Suzette moved in with Frans at the nursery started by his parents, Jaap and Annet 30 years ago. There, the van Dorsser’s grow roses and gerberas for the cut flower trade. Suzette carried on working at Franklin Centre for nearly five years and became involved with the Franklin Arts Festival, an event she remains passionate about. Following the amalgamation of Auckland Council, Suzette became dissatisfied at how the centre was being run and left to spend more time with her young family which now totals three sons, Jakob, Joost and Otto, aged 6, 5 and 3 years. Being surrounded by flowers has influenced her work and Suzette says she can’t help including them in many of her pieces. But says she is always drawn to the sea as was seen in her most recent exhibition, Displaced Vessels, a collaboration with Lois Templeton and Stephenie Collin at the Franklin Centre. Although she finished her degree as a painter, Suzette has worked a lot with fabrics, sewing and collage. And, after attending a printmaking workshop with Esther Hanson of Pukekohe High School, she took to the medium ‘like a duck to water’. “It opened up a different way of working and I liked the idea of printing a whole layer all in one go. I really love that. I use printmaking to paint, I wouldn’t describe myself as a printmaker because I’m not technically accurate. It’s more a means of painting. For her recent exhibition at Franklin, Suzette says she spent about six months creating a huge amount of work, about 32 pieces, not all of which ended up in the exhibition. 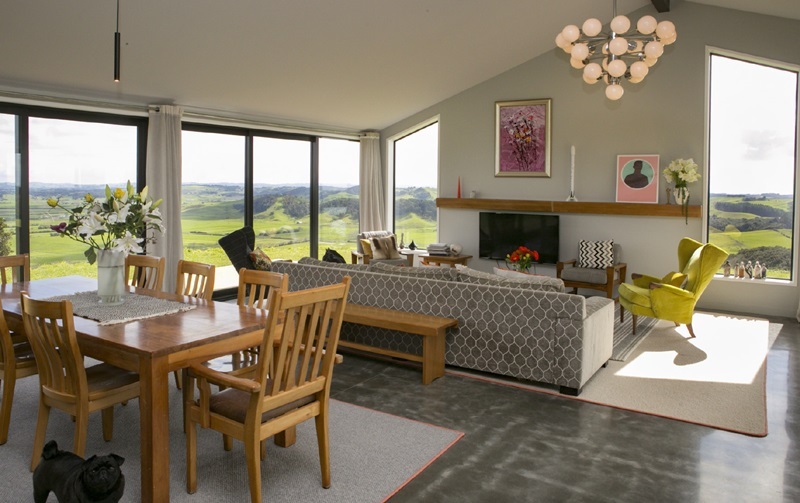 Despite a busy life, some three years ago she and Frans decided to design and build a new home at the nursery in what was formerly a paddock overlooking the Waikato River delta. The family moved into the resulting house on the hill almost a year ago. “We had a very strong idea about what we wanted so we worked with an architect who helped us design what we had in mind. We wanted something that was super, super simple, no frills, but that made the most of the views. The unassuming timber-clad, single-storey dwelling fulfils the brief and more. The panoramic scenery, courtesy of glazed doors the length of two walls, is breathtaking. The living area consists of a large, high studded room containing a kitchen, dining room and lounge, flooded by natural light and those stunning views. Furnished with Suzette’s artistic flair, she’s slowly adding rugs to a fabulous polished concrete floor to soften the acoustics. The overall effect is a designer’s dream. Suzette van Dorsser says living at the family nursery is a joy and a great family lifestyle. 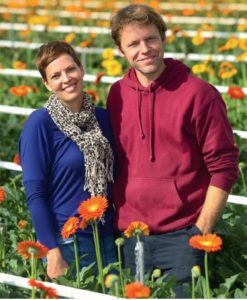 The nursery covers two hectares mostly under glass, with some 140,000 rose bushes of around 40 varieties and 15 types of gerbera. 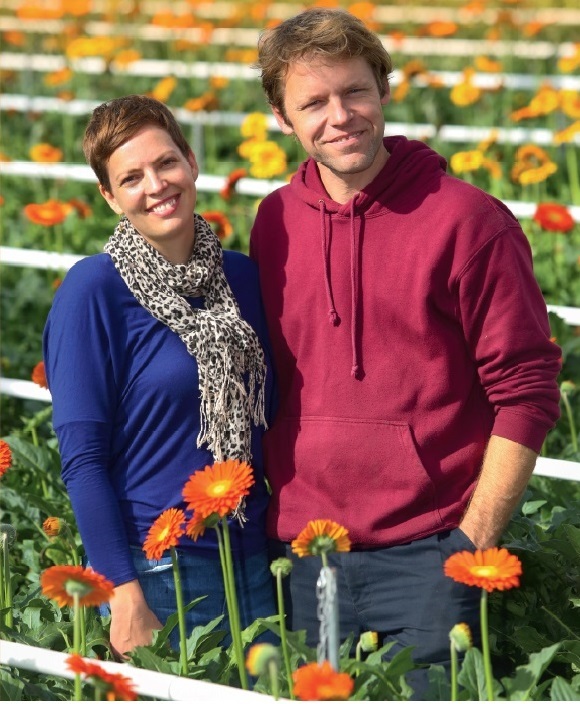 All colours are grown but Frans says the most popular colour is red followed by white and orange and yellow gerberas. The flowers are packed into bunches and sent to Auckland Flower Market several times a week where they are bought by florists and wholesalers for the domestic market. Frans worked as a winemaker overseas and for Babich in NZ after studying oenology in California. He returned to the family business 10 years ago and set about expanding it. Picking is done seven days a week all year round barring Christmas and New Year when they take a break. “When we come back from holiday we have to throw all the flowers away, so one year I decided to use the roses in an art installation at the arts centre and called it ‘The Party’s Over’,” said Suzette. “I had so many comments from people telling me what a waste it was including one lady who asked if she could have some for her wedding. Suzette’s next exhibition is at the Nathan Homestead in Hill Park, Manurewa, in November. It will be a joint show with fellow Franklin artist, Elizabeth Crosby.